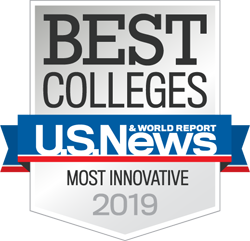 Sweet Briar’s Intercollegiate Horse Shows Association team finished its season on Sunday at the University of Mary Washington as the high-point team with an amazing nine blue ribbons and 44 points out of a perfect score of 49. Makayla Benjamin ’18, who won both her open-flat and open-fences classes, tied with first-year student Katie Balding ’21 for high-point rider. Balding won both her novice-flat and fences classes. The tie was broken by the judge, which resulted in Benjamin being named high-point rider and Balding reserve high-point rider for the day. Courtney Barry ’18 qualified for Region Finals in intermediate fences with a blue ribbon. 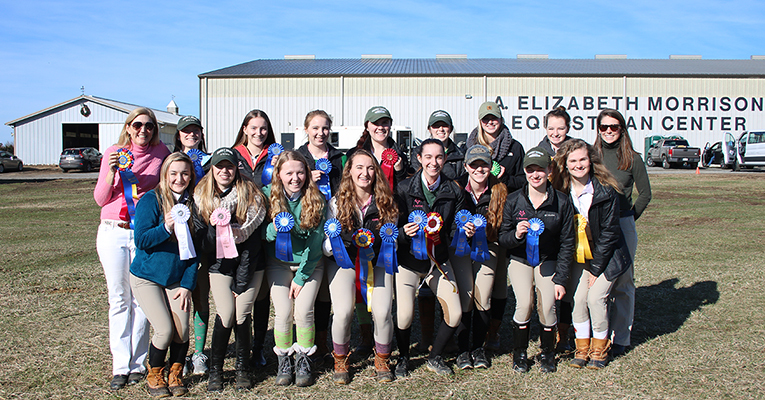 More blue ribbons went to Jules Sudol ’18 in intermediate flat, Lily Peterson ’21 in novice flat, Abbey and Ellyn Narodowy ’20 in advanced walk, trot, canter, and Jade Ashley ’20 in beginner walk, trot, canter. Second-place ribbons went to Peterson in novice fences and Kaitlin Duecker ’21 in novice flat. Third-place finishes went to Madeleine McAllister ’21 in walk, trot and Emily Schlosberg ’19 in open fences. Schlosberg also rode in intermediate flat and placed fifth. Nicole Sabovik ’19 rode in novice fences and was fourth. Aoife Magner ’19 placed fifth in open flat while Megan DeRidder ’20 placed sixth in intermediate fences. On Saturday, the team started off strong at UMW with Benjamin, who won both her open-fences and flat classes, which resulted in earning her high-point rider for the day. Magner placed fourth in open flat. Magner and Benjamin both qualified for Region Finals in open flat. Schlosberg rode in open fences and placed second. Riding in intermediate flat, Sudol placed fourth. Barry was next to ride in intermediate flat, placing sixth, and fifth in intermediate fences. DeRidder also competed in intermediate fences, landing in sixth place. In the novice division, Peterson won over fences and was fifth on the flat. Sabovik also competed in novice flat and placed fourth. Duecker had a great ride in a large class of novice fences. In advanced walk, trot, canter, Chandler Fox ’20 placed third and Ellyn Narodowy placed sixth. Ashley won her beginner walk, trot, canter class. Finishing the day strong was McAllister, who placed fourth in walk, trot. Saturday’s competition landed the Vixens in third place overall. The team looks ahead to Region Finals at Liberty University on Saturday, Feb. 24. The competition starts at noon. More upcoming riding events can be viewed on our calendar.